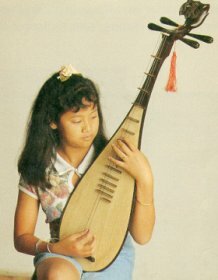 The Dan Ty Ba is a four-string instrument of Chinese origin which is frequently present in a traditional orchestra. Its soundbox is shaped like a pear cut in half lengthwise. Its soundboard is made of unvarnished light wood, and its back is made of hard wood with a slightly convex surface. The neck is short and tightly fixed to the soundbox. Originally the neck bore no frets; now, however, it has four frets in addition to eight others on the soundboard and two under the strings with the highest pitch. The frets stand low and close to each other following the heptatonic scale. The instrument has four pegs for tuning. The strings, formerly of twisted silk, are now made of plastic. The player uses a plectrum which she holds in her right hand and plucks either upward or downward in a quick run. The technique for left hand, which presses the strings, includes glissando, staccato, arpeggio and tremolo. The Dan Ty Ba music is light and cheerful. The instrument is played solo or as part of an orchestra or a band accompanying the singing of Hue melodies or cai luong operas. Ty Ba recitals are well liked by music lovers at home and abroad. Though related to the Japanese biwa and the Chinese pipa, the Ty Ba has a personality of its own.